Welcome to the perspectives of Nietzsche, the best organized collection of Nietzsche quotes on the internet. 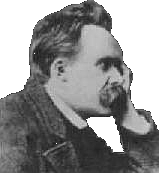 The quotes are organized by category, essential to truly understand what Nietzsche meant, and unlike some other sites that organize them by book or by no criteria at all. Click the category links above to find out what Nietzsche meant by Will to Power, Eternal recurrence, and more.